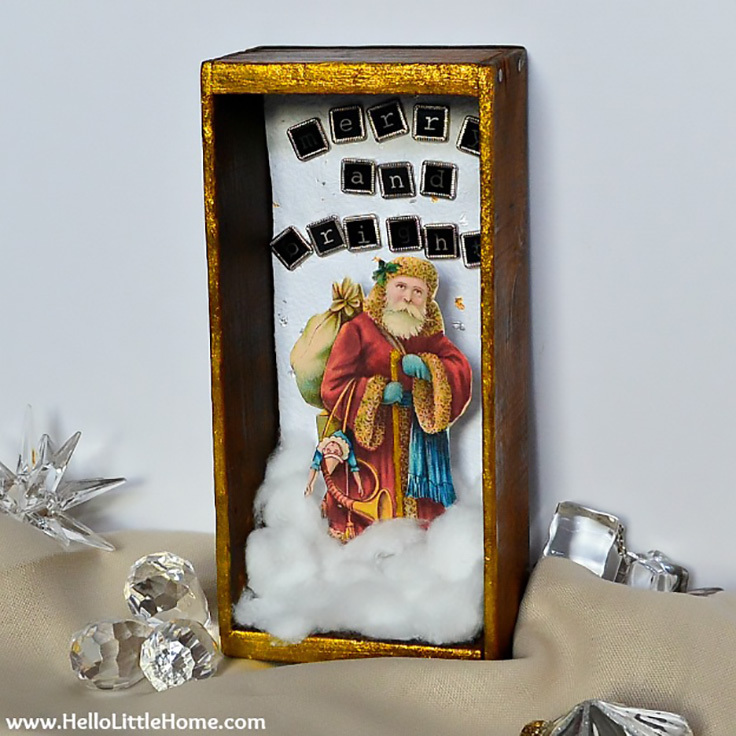 Shadow boxes are one of the most popular Christmas decorations you can get. They look incredible and give out such warm, Christmas–y vibes to your home. The great thing about them is that you can even easily make your own! Creating shadow boxes at home is a fun, quick DIY project that won’t empty your pockets. You can even do it together with your children as a family fun activity! There are plenty of ways to decorate a shadow box, so make sure to check out our ten favorite below. Ever wanted to have your very own enchanted forest? This shadow box looks so pretty that you’ll want to have it every room of your home. 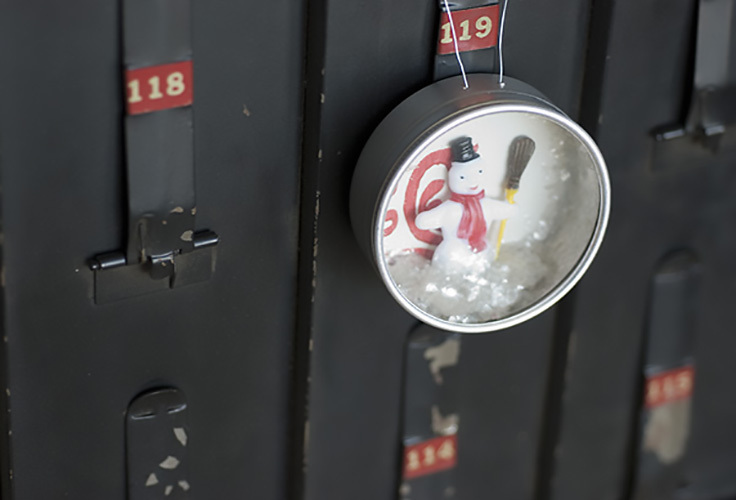 It’s fun project that requires just few materials – glam shadow boxes, cotton as snow, copper – wire lights and brush trees. Play with the elements and arrange them – either way you do it’s going to look perfect. The advantage of having a chalkboard glued to the back of the shadow box is that you can write or even draw whatever you want with a chalkboard marker. 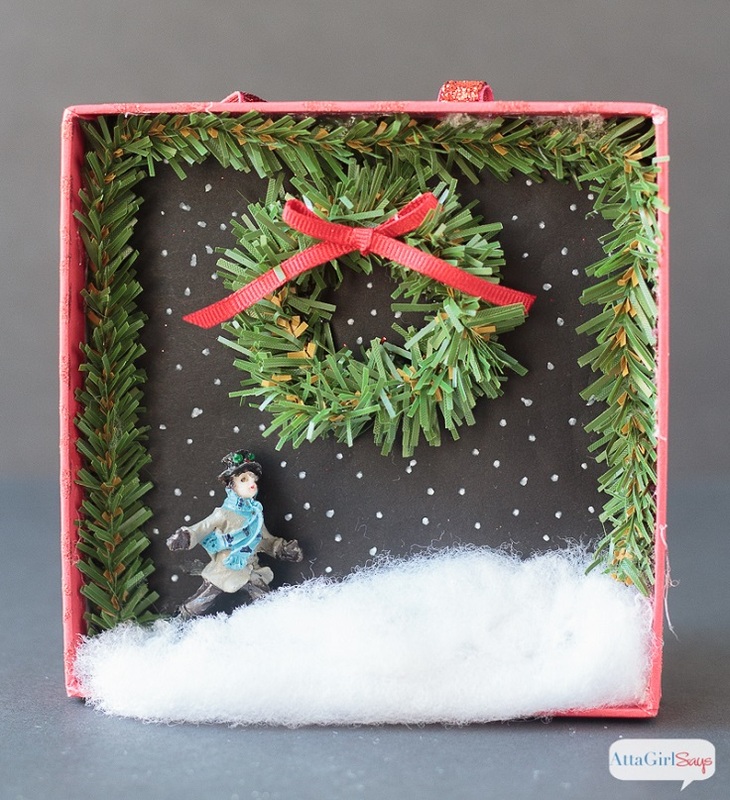 Take this shadow box as example – there is snow in the background, which makes this box even more Christmas-y. You will also need glue, Christmas figurines, garland ties or chenille stems, bottle brush trees and ribbon. Simple – looking, but still so adorable and Christmas-y! 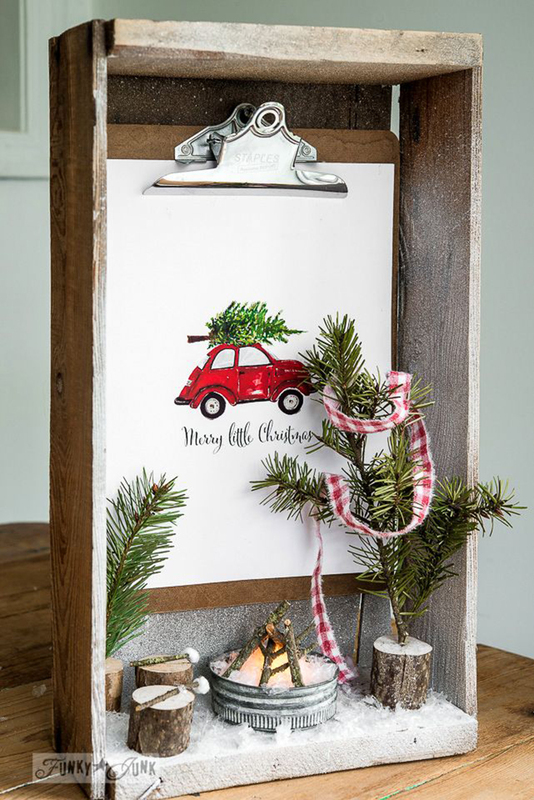 For this shadows you just need few materials – shadow box, black paper or cardstock, white paint pen and different elements to achieve the winter-y look, such as tiny cars, bottle brush trees and cotton snow. Write down your favorite Christmas quote or something fun for the background. You decorated your Christmas tree and you still got few more ornaments? 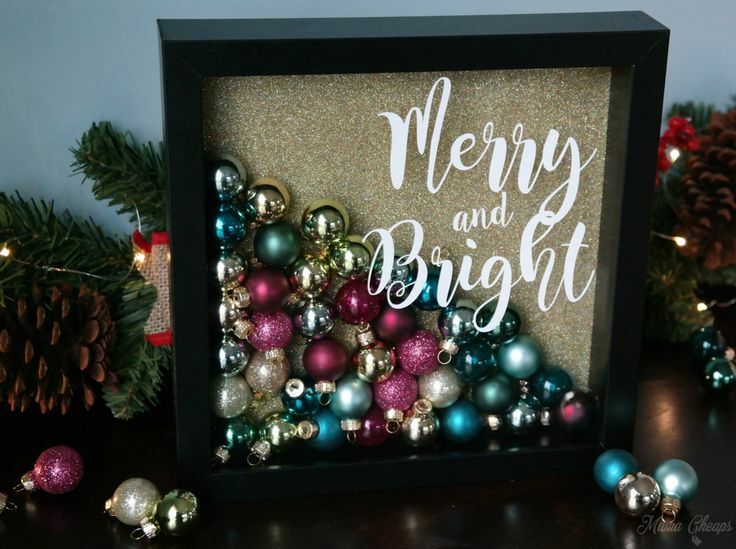 One of the best Christmas decoration is the shadow box, for which you need different ornaments, background for picture frame and words cut out of vinyl. Your background can be piece of glitter heat transfer vinyl as pictured, or scrapbook paper, fabric or wrapping paper. The perfect winter-y scene, isn’t it? We found it so lovely that we wish we could have it right away! To create this shadow box, you box an outdoor picture you love, fire pit/mason jar lid, battery operated tea light, faux snow and sticks, 2 branch cuts, 2 branch cuts with evergreen sprigs, spray snow, plastic snow, marshmallow roasting, branches and q-tip fuzz. 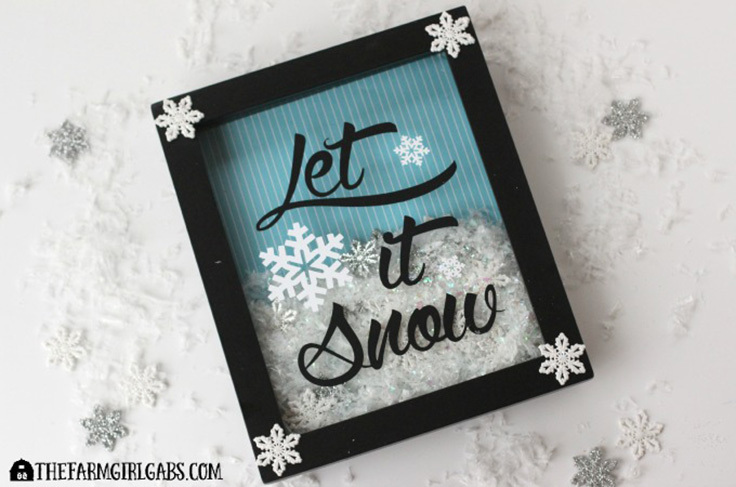 If you’re looking for a smaller shadow box that can be put anywhere and won’t occupy a lot of space, then you can consider making a shadow box ornament. You can attach it on the wall or the door, or use as Christmas decoration on your tree. You need 1- 2 ¾ ” round aluminum tin, hand held hole punch, florist wire, decorative paper, assorted decorative items or figurines to fit tin and sparkle flakes. Not a fan of ribbons and springs? 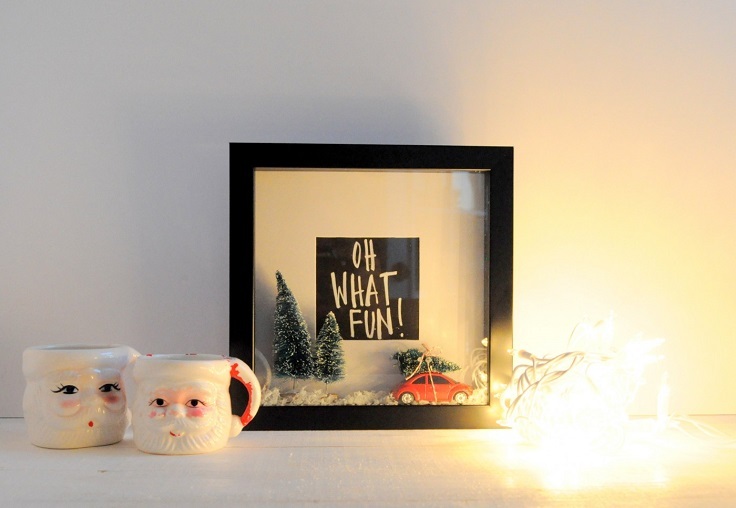 There’s another way you can decorate your own shadow box. For this, you will need sparkly iridescent snow, light scrapbook paper and some glitter snowflakes. You can use Silhouette Cameo for the letters, or use sticker quotes or even sticker letters to come up with your favorite Christmas quote. 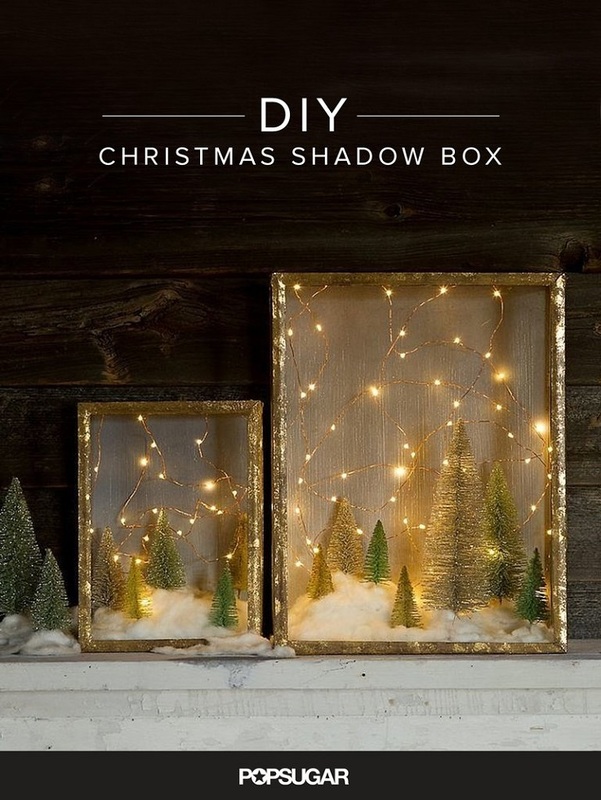 Very simple and creative, this shadow box is also a budget – friendly idea that will bring warm and Christmas vibes to any room you’ll put it into. This is also a great decoration for those of you who like all things rustic. 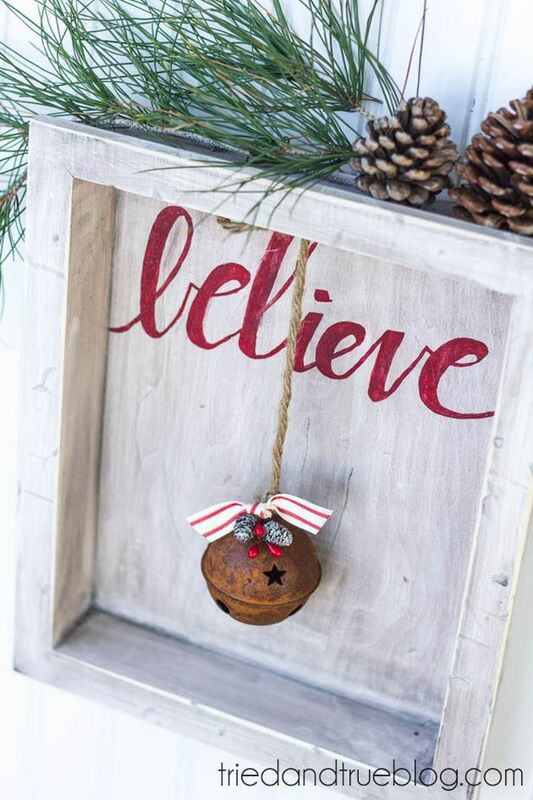 You need both chestnut and white wood stain, red paint, rustic jingle bell, jute rope, decorative ribbon, small pinecones, staple gun and hammer. Here’s something for the vintage fans. You can make your own vintage shadow box without spending so much money on it. For this project, you need vintage clip art, decorative papers, various decorative elements, such as ribbons, cotton balls, glitter, tinsel, faux snow and greenery, paint or nail polish, hot glue gun and scissors. 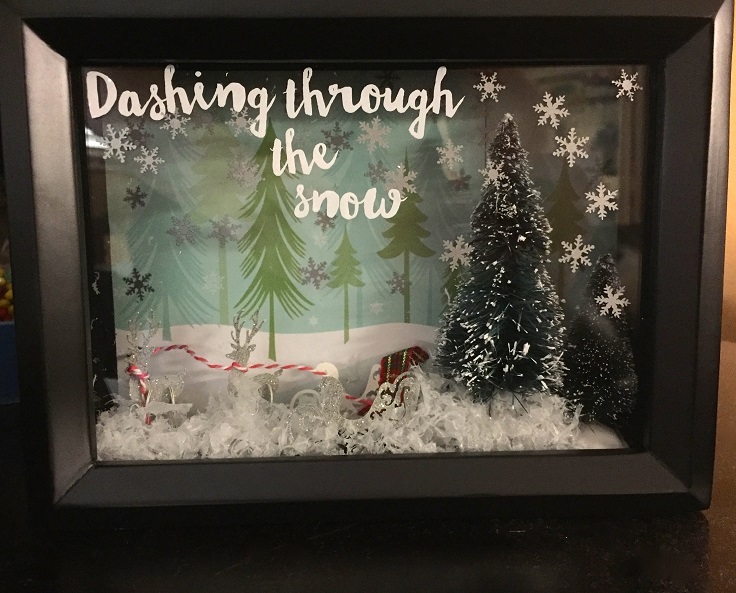 And last, we have a shadow box with our favorite Christmas line of all time! Just by looking at the box will remind you of the song and make you cheerful for the beautiful holiday ahead of you. That’s why, make sure to fill the inside of the box with different elements that will make the box look as Christmas-y as possible! Love all of the ideas for shadow boxes. Going to take it a step further for everyday life.